I was thrilled to see that Bungalow Barbara chose a recipe for TWD that can swing sweet or savory– Sablés. Between all the junk I munch on at the bakery, and all the desserts I make at home, these days I need a salt fix more often than a sugar fix. I went with a parmesan cheese sablé, and since I had heaps of fresh herbs left from Thanksgiving, I threw some thyme in there, too. Cheesy, buttery and salty…with that perfect crumbly texture– exactly what I wanted with a glass of white wine. For the recipe, see Baking: From My Home to Yours by Dorie Greenspan (it’s also here), or read Bungalow Barbara. Don’t forget to check out the TWD Blogroll! They sell these in a shop called Petit Duc in my favourite French town, St Remy de Provence. They are divine as an appetiser with some sparkling wine. I had forgotten they existed until now and I’m excited to hear I can expect to see lots more of them on TWD blog posts. I would opted for savory over sweet and parmesan & thyme would be at the top of my list! That looks fantastic – I definitely need to get this book! I don’t even work close to food and I feel the same sugar overdose. Your picture makes me want to try this variation. I saw this option in the book and was really intrigued. I’m so glad someone made them. They look and sound so wonderful! What a perfect idea during a sweet filled month. They look so good and Im glad you enjoyed this recipe. I did too! Yum! It didn’t even occur to me to go the savory route. Nice! Your sables look and sound like perfection. Save me some. How beautiful! This is the first savory version I have seen today, they look great! I will not be doing the savory way…I just can not imagine a savory cookie. Oh, I love your savory version! These would be perfect with a glass of wine! How refined and elegant! I knew you would do amazing things with these! Your sables look fantastic. They must have been amazing with the parmesean and thyme!! Your photos are always so perfect! dang! I’m jealous. i really wanted to try these Parm ones…but I didn’t plan ahead. I love that you used thyme. Oooohhh, savoury sables – love it! I would definitely opt for these over the usual sweet butter cookie (not that they’re bad). I’m hoping over to check out the recipe. Those look delicious! Someone else made Parmesan sables and I think they not only sounded wonderful but that they would be great with a crisp salad. Soooo happy to see you posted on the savory parmesan version!! They look perfect! I really want to try this version! I’m glad you were one of the ones to try the savory variation! They look delicious. Okay, totally kicking myself for not going the savory route – those look and sound fantastic! I find salt fixes less addicting than sugar fixes. I’d love to try these cookies. I really want to try this variation. Yours look lovely! Okay, you’ve convinced me. I will HAVE to try the savory. Sound wonderful. Wonder how herbs de Rrovance would do in them. Well who doesn’t like parmesan??? 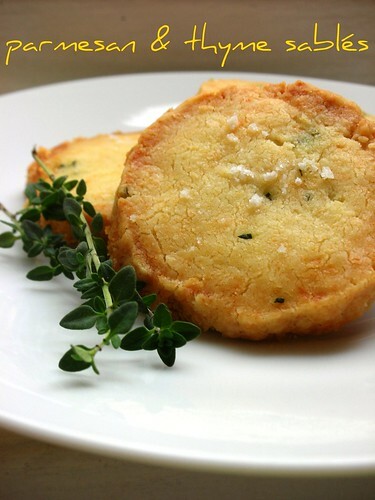 LOVE these – and love that you ventured into “savory” sables! These look incredible… bet they taste just as good! Beautiful! Yours are simply lovely, and very delicate looking! Bravo, Steph! What a great twist on these! I absolutely loved the basic recipe, so I will definitely give a savory version a try! Pretty! I love the basic recipe so much I can’t get past it to make any variations, but these look fantastic. I’ll have to give them a whirl. These are great!! I shall try these!!! Absolutely beautiful and I bet they tasted soo good. I wish I would have seen this before I made mine! the savory ones were good, huh? I’ll have to try it! This sounds delicious! I thought my pecan ones were okay, but I think I would have liked these much better. I think the texture of sables is perfect for savory flavors. The parmesan version looks divine. It seems like everywhere I turn there are sweets, definitely a good call to make something savory. I am definitley going to have ot try these this way. I am sure they were delicious! Lovely…thyme in a cookie, wow! I know you’re vegetarian, but I’m dying to spread some chicken liver paté on these. Mmmm, I’ve never baked a savoury cookie. Think it’s time to start! Cheesy, buttery, salty is all I needed to know. The thyme doesn’t hurt either! I love that there is no sugar in these and I wish I had a few about now. I’m already on sugar over load and how many days until Christmas. A thousand thank yous for sharing this variation. That looks wonderful! I have the book and haven’t tried anything from it yet. Time to get it out. Forget all the other kinds of sables…just forget them…THESE are the ones I want! What a great combination of flavors…yep, you win with this one for that recipe! Those sound delicious! I’m made the sweet ones a couple times now; I want to do savory ones next. Thyme is one of my favorites. Mmm.